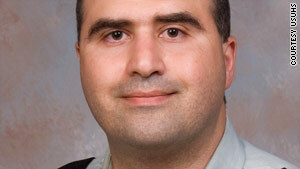 Maj. Nidal Hasan, an Army psychiatrist, faces 13 counts of premeditated murder. Washington (CNN) -- An upcoming military review of the Fort Hood, Texas, shootings finds that the alleged shooter, Maj. Nidal Hasan, was promoted despite supervisors' concerns about his extremist views on Islam and odd behavior. The review also says that a lack of communication between the U.S. military and a terrorism task force did not allow the sharing of information to determine whether he was a terrorist threat months before the shooting. CNN was told details of the Pentagon review by a U.S. official with direct knowledge of the report. The official did not want to be identified because the report, requested by Defense Secretary Robert Gates, will not be officially released until Thursday. The Defense Department review, led by former Chief of Naval Operation Adm. Vernon Clark and former Army Secretary Togo West, will recommend the Army and the entire military focus more on looking internally for potential threats among the troops, according to the official. The review does not look into the reported e-mail communications between Hasan and the radical cleric Anwar al-Awlaki, who is based in Yemen and also has possible ties to the Christmas Day airline bombing plot. Those ties are being looked at in a separate criminal investigation by the Army. The publicly released part of the report will not discuss Hasan's actions the day of the shooting at Fort Hood because that, too, is part of the criminal investigation. In November, Hasan walked into the processing center and began firing his two handguns while standing on a table yelling "Allahu Akbar" ("God is great" in Arabic), killing 13 people before being shot numerous times by base security officers. Hasan remains in a Brooke Army Medical Hospital in San Antonio, Texas, where he is paralyzed from his wounds. He is charged with 13 counts of premeditated murder and 32 counts of attempted premeditated murder. The review outlines elements of Hasan's behavior that should have triggered supervisors and senior military officials to look more closely at his behavior. It questions why Hasan was allowed to keep his security clearance after numerous questionable actions that should prevent military members from getting one. Among those actions: a class presentation where he said the wars in Afghanistan and Iraq were a war on Islam and that Islamic law was more powerful than the U.S. Constitution and justified suicide bombing, according to the official. Questioning the Constitution is grounds for dismissal as an officer, as well as grounds for having a security clearance revoked or not awarded, the official said. Yet Hasan was given the clearance and continued to be promoted afterward. During his time in Washington, Hasan's religious views became increasingly apparent. He took a trip to Mecca, Saudi Arabia, to take part in the Haj -- a pilgrimage that devout Muslims are expected to do at least once in their lifetimes if they are able. In July, Hasan reported to his new position as a psychiatrist at Fort Hood. The report says supervisors knew he had poor performance reviews before the move but was posted at the large base because his poor work would not be as noticeable. The report is expected to show that Hasan's superiors were all able to clearly see in his records that as an officer, medical student and a psychiatrist, Hasan was a repeat poor performer. He took six years to graduate from medical school instead of the four years it takes most students. He was on academic probation for receiving numerous below average and failing grades between 1997 and 2007 at the Uniformed Services University of Health Sciences in Bethesda, Maryland, according to the official. After graduation, Hassan began his internship in psychiatry, a four-year program at Walter Reed Army Medical Center in Washington. Very little changed in his performance reviews, and teachers and supervisors told him of their concerns. He did not see many patients and required monitoring. But the official with knowledge of the review said after being spoken to about his lacking performance, Hasan would focus and improve for a while before slipping back to performing poorly again. Despite his history of poor grades and performance, Hasan's officer evaluations were strong including the words "satisfactory" and "outstanding." He was promoted to the rank of captain and then major in the standard same time spent in those ranks along with stronger performing colleagues. Hasan was promoted from captain to major in May, military records show. Because of a shortage of majors in the medical corps, the promotion board was given the authority to promote captains who otherwise would not have been considered for a promotion, according to a U.S. military official who asked not to be identified in connection with discussing personnel matters possibly related to the Hasan investigation. Hassan was also disciplined for inappropriate conversations with patients about religion. By 2007, a new supervisor of Hasan's, Maj. Scott Moran, got tough with him. Moran was the director of the psychiatry residency at Walter Reed. He chastised Hasan for not being reachable while on-call and counseled him that his research project about internal conflicts of Muslim soldiers was not a topic appropriate for the program. Moran also developed a performance-improvement plan for Hasan. Hasan continued with his presentation regardless of his supervisor's reprimand. The review found the presentation was approved as meeting the residency program requirements despite the reprimand, according to the official with knowledge of the review. Upon completion of the residency program, Moran wrote a positive reference letter for Hasan, saying he was a competent doctor, according to the official with knowledge of the report. Hasan then started a two-year fellowship in preventative and disaster psychiatry that he completed in last June, before moving to Fort Hood in July. In addition to retracing Hasan's history performance as a military psychiatrist, the report will recommend changes for the military. The military needs to develop new and more precise methods of sharing information on people of concern between the military and intelligence agencies, the report will say. The report also will recommend a new process for encouraging troops to alert commanders to people of concern instead of the current attitude in many units of a more "boys' club culture" of not turning problem troops in, according to the official. The investigation also recommend ways to overhaul the military performance evaluation system. The review suggests holding officers accountable for their poor performance reviews, preventing them from moving up the ranks. It also finds supervisors "don't want to rock the boat" and prevent junior officers from getting promoted, the official said. In a separate aspect of the Hasan case, Hasan's civilian lawyer, John Galligan, told CNN on Tuesday he is frustrated with the "deliberate, intentional actions," by the Army to make it impossible for him to conduct the proper discovery in the case. "He has a right to proper pretrial procedure," Galligan said. Galligan said his legal team is hitting some resistance in access to basic information from the military, including the Army's Criminal Investigation Division office not allowing the photocopying of paperwork related to the case. He said he has not encountered that in his 30 years as a lawyer. He also would like to have the courts-martial moved from Fort Hood for a more fair trial. Because the president, the Army chief of staff and the Fort Hood commander all attended a memorial service there it is not a place, Galligan believes, that Hasan can get a fair trial. Galligan's access to Hasan has also been limited by the military, he said. He has had trouble seeing him on visits to the hospital. He would also like Hasan moved to a closer medical facility to Fort Hood because traveling between Hood and San Antonio is difficult for his legal team. His requests have gone unanswered, he said. The military did not return a request for comment.